To make the cheese sauce, melt the butter in a large saucepan over medium-high heat. Whisk the flour into the mixture, stirring constantly until it begins to turn golden (about 3 minutes). Add the milk into the mixture and continue to whisk until clumps have broken up and sauce begins to thicken (about 10 minutes). Add the next 7 ingredients, salt through the pepper jack cheese, to the sauce and continue to stir until all of the cheese is melted and the consistency is smooth. Turn to simmer, cover and keep warm for the tacos. In a large skillet, cook the chorizo and ground beef, making sure to break up any large clumps (about 5 minutes). Add the onion, seasonings and poblanos and continue to sauté until the onions are soft (about 5 minutes). 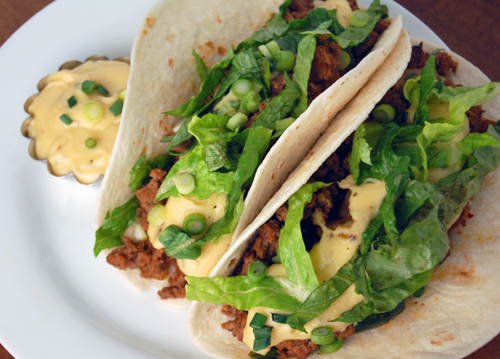 Add the meat mixture to each taco, drizzle with cheese sauce, top with green onion and lettuce, then serve. The cheese sauce sounds wonderful on its own but I really like the rest, too. I bet the tacos were so flavorful from your addition of chorizo and peppers. Yum! These tacos, with all their melty cheese, is totally calling my name! Love that they are chorizo! Aww, no more junk food – pout. J/k. But really, the title of this post had my attention at hello. It sounds amazing! You can still post about healthy great tasting food, but thank you so much for this one last sinfully good dish, sounds amazing! Ha! I love that you describe your recent eating habits as being on a bender. It does feel like that sometimes. I saw your tweet that you made this and forgot to comment. Hooray for foodbuzz because now I have my chance to tell you that this recipe sounds amazing. As I say that I’m peeking up to see your link to the chili cheese dogs. Yum! So glad you didn’t end your bender before sharing this one! Anything with Chorizo is delicious and we’ll definitely add this to our list our comfort foods! Love this tacos recipe and it looks so tasty! Thank you for sharing this mouthwatering recipe. Spicy, cheesy and beefy – all the things that make a great taco. 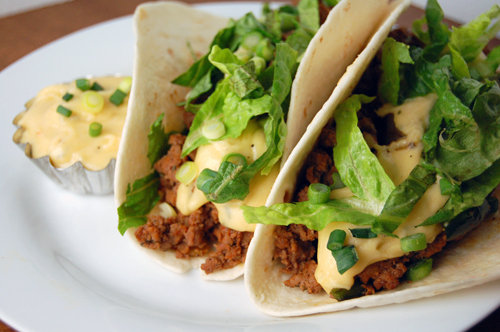 oh my these tacos look so incredible! Melty pepper jack…mmmmmm…great looking stuff! Oh wow!!! this tacos look absolutely amazing! Love this and you made it soooo tasty! Wonderful photos too! Nicely done my friend! These pictures are seriously making me hungry. The tacos looks so delicious! The BH is always asking me to make tacos more often. I think he would fall over if I made these for him! They look awesome!! Love the cheese sauce! ¡Que la salsa de queso es realmente buena! My boyfriend is going to love these. Thanks for sharing! Congrats on featured dish today! Looks terrific. I have chorizo in the freezer right now. A friend gave us some and I’ve been looking for a recipe. Thanks! Thanks! If you are looking for chorizo recipes, you have come to the right place… I loveee chorizo! Here are a couple other ones your might enjoy. My favorite probably is the enchiladas.. they are out of this world! These look so delicious! I will be giving this recipe a try! Thanks so much, this will be upcoming event recipe. I like it, it is new to me and am gonna try it.